There’s no doubt about it – Leo Vegas is one of the finest, most impressive casinos on the Internet. From its vibrant, upbeat design and its exciting promo offers, to its award-winning mobile platform, Leo Vegas Casino ticks so many of the right boxes when it comes to interactive gambling. Offering games from a collection of the world’s leading software developers, including one of the biggest live dealer selections you will find anywhere on the Web, the verdict is in – Leo Vegas takes the crown as one of the best online casinos available to casual and real money players. What kind of player is Leo Vegas for? Leo Vegas caters to online players of all kinds, whether the slots are your jam or online blackjack is more your cup of tea. 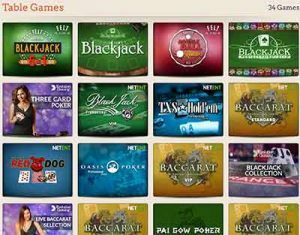 It’s an instant-play casino site, which means as long as you have a reliable Internet connection you can play games directly over your Web browser regardless of what computer or device you’re using. If live dealer games get you going, Leo Vegas will become an instant favourite as this is one of the only top-rated casinos offering live dealer games from multiple providers in the one space, with over 32 variants of live dealer roulette available alone. Leo has also won multiple awards for its stunning mobile casino site, which is widely considered to be the best real money mobile casino available on the Web today. 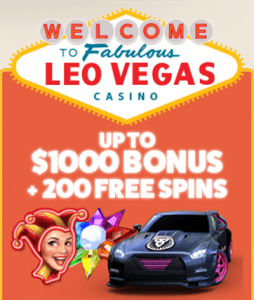 Several countries are restricted from playing for real money at Leo Vegas, although this information is not clearly displayed on the sites terms and conditions. Amongst others, Leo Vegas does not accept players from Australia, Spain, United States, South America, Africa or Asia. $1000 Welcome Bonus – New players receive up to $1000 in matched deposit welcome bonuses, along with 200 free spins to use on designated slot games. As soon as you open an account, you will receive 20 free spins with no deposit required, with an additional 180 free spins added once you make your first real money deposit. Free spins can be used on the most popular slot games, Gonzo’s Quest, Starburst, Twin Spin, Dazzle Me or Jack & the Beanstalk. Make a first deposit of at least $20 and LeoVegas will match is by 200% up to $100, followed by 100% up to $300 on your second deposit, and 50% up to $300 on your third and fourth deposits. The welcome bonus is not available to players from United Kingdom, Canada, New Zealand, Ireland, Austria, Switzerland, Germany, Sweden, Norway, Finland, Slovakia, and Denmark. All winnings made from bonus money are subject to a 35X wagering requirement, which is pretty standard as far as play-through requirements go, if not teetering on the higher side of the scale. 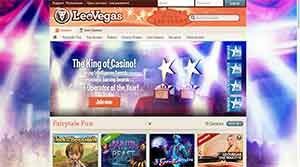 Any one-off promos available exclusively for registered players can be found by heading to LeoVegas.com and clicking on the ‘promotions’ tab at the top of the page. The loyalty reward program at LeoVegas is aimed to help dedicated players obtain VIP status. When you register for an account and start playing games for real money, you will notice there is a VIP Level bar at the top of the screen. Every real money bet you place will add extra fuel to this VIP bar, increasing your loyalty status by a tier every time it is successfully filled. VIP Levels range from one to 70+, and each month a player from each loyalty tier receives a prize, which could be anything from an Apple gadget to tickets to VIP events. As you climb higher towards VIP status, you can claim invitations to exclusive VIP events, get your own dedicated account manager, personalised payment services, unique birthday rewards, LeoVegas Roaring Rewards bonuses and more. As mentioned above, Leo Vegas is an instant-play casino, which means all games are available directly over your Web browser (Safari, Chrome, Explorer, etc) without having to download a thing. Same goes for the mobile casino, although a native LeoVegas casino app is available for those who prefer to play on their phone or tablet using downloaded software. Instant-play gives you the freedom to sample games for free in practice mode with no commitment to place a real money wager, and with no space taken up on your desktop or mobile hard drive. To go specifically to the live dealer games, you need to switch from the standard casino to the live dealer casino by clicking the buttons at the top of the game lobby. The live dealer suite is where Leo Vegas really gets its moment to shine, offering live games from Evolution Gaming, NetEnt, Ezugi, Lucky Streak and LeoVegas Live, all in the one safe space where all games are available for instant-play. Leo Vegas also offers a Chambre Séparée, which is a private gaming area exclusive for VIP players. Chambre Séparée offers round-the-clock games run by highly professional dealers, with the suite undergoing an upgrade mid-2017 to increase the number of games available, the number of camera angles and an improvement on the lighting and sound. Players in the Chamber Spare can now chat with the live dealers during gameplay for a more interactive approach. Players at Leo Vegas can deposit using local currency, with deposits accepted in EUR, GBP, SEK, NZD, CAD, CHF, CZK, NOK and DKK. If your local currency is not accepted, it simply means you will be subject to currency exchange fees as your money is converted into one of these more widely accepted currencies. The deposit options available vary depending on which country you’re playing from, and you will be able to see the full range of deposit options available to you once you’ve signed up, logged in and headed to the deposit page (customer service wouldn’t provide this information to us over live chat, which was one of the only disappointing experiences during our testing with Leo Vegas). Deposit options available include Visa, MasterCard, Neteller, Skrill and Paysafecard, with minimum deposits of at least $10 required each transfer. If you’ve never made a real money deposit to an online casino before, read our beginners guide here. As far as licensing and reputation goes, online casinos don’t get more legit than Leo Vegas. While the casino operations are based in Malta, the technology behind it all is developed in Sweden. The company is registered in alignment with Maltese law and the casino is fully licensed by some of the best gambling jurisdictions in the world – the United Kingdom Gambling Commission, Malta Gaming Authority and the Danish Gambling Authority (Spillemyndigheden). All transactions are protected by 2048 Bit SSL (Secure Socket Layer) digital encryption, which is the highest level of online security available, ensuring players can make real money payments while enjoying full peace of mind. Players from countries where gambling is wildly popular (like Australia) are not accepted, so not all punters get to enjoy this site. The bonus offers and promos are only available to players from select countries. Customer service staff in the live chat section can be wishy-washy when providing requested information. Banking options available are not presented until you register for an account. It is licensed and regulated by the best online gambling jurisdictions and has an outstanding reputation for safety and reliability. 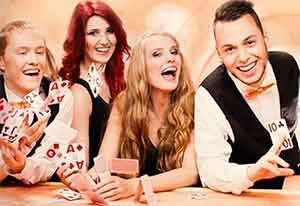 The live dealer casino is absolutely spectacular, offering the largest collection of live dealer games you will find online. Slots and table games are available from a selection of the best software developers in the business. The award-winning mobile casino site makes playing your favourite online casion games a breeze from anywhere you can secure an Internet connection. Head to Leo Vegas Casino today to sample the impressive collection of instant-play games available, and see if you’re eligible for the new player welcome bonus which includes up to $1000 in matched deposit bonuses and 200 free spins to use on NetEnt’s finest slot games.